In late spring I gave a practice talk at the Associated Graduate Students Symposium (click picture to see video). 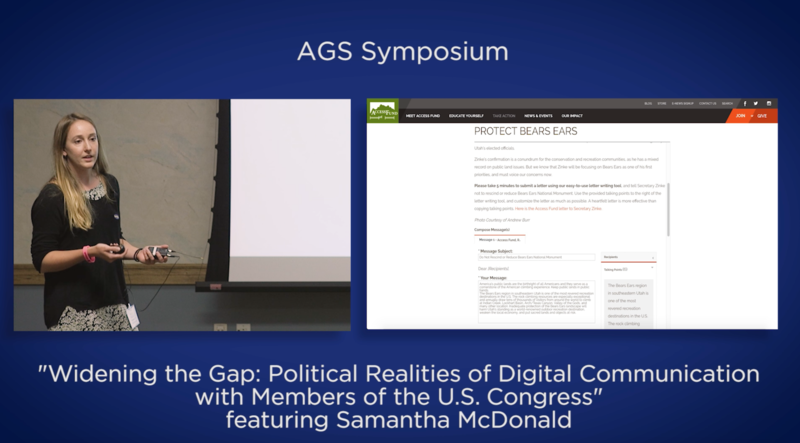 The talk described the beginnings of my research into constituent communication in Congress. I decided to give this talk to practice my speaking skills and to articulate my research goals. More than six months later, AGS finally sent my a copy of my talk to review. I have to say, I think I did better than I expected. It’s always really awkward seeing yourself on video but when I focused on the content, it wasn’t bad. I think my thoughts flowed well and I got my ideas across. I thought my slides were clean and easy to understand. I definitely need to slow down and stop moving my hands so much 🙂 I tend to be a fast talker and I get really nervous when I talk which makes me speed up even more. I need to be more cognizant of my pace and breathe more, which will hopefully make everything else slow down as well. There were also a few talking points that are now outdated. I should have been more clear that not all Congressional offices are using 50% of their staff for constituent communication, but some of them were according to CMF statistics (I’m pretty sure I remember is being CMF statistics. I have to double check). I am also not conducting a qualitative study of users of automated letter writing tools, at least not yet. But now looking back, that still seems like an interesting idea.